Planetary nebulae are some of the prettiest objects we can see in a night even in a backyard telescope. They show us the endgame of life for a typical star and also forecast the fate of our Sun and solar system. Finally they start gaining the recognition they deserve as some of the most revealing and useful objects in the universe. Glowing like a multi-faceted jewel, the planetary nebula IC 418 lies about 2,000 light-years from Earth in the constellation Lepus. Despite the name, these objects have nothing in common with ''planets''. They do however represent the likely final episode of solar type stars. A star is born, lives, grows old and dies. Most of its lifetime a star shines by burning hydrogen into helium in its centre. A star starts to die when it has exhausted the nuclear fuel in its core. Its longevity depends upon its mass: the heavier the star, the sooner it dies. Massive stars die very violently in a bright explosion, called a supernova. The vast majority of stars, like our sun or up to eight times heavier, die more gracefully, more slowly. After exhausting its thermonuclear fuel supply in the core, the outer layers fall inward. On their way in they ignite, causing the outer material to be flung outward in an expanding cloud of gas. When only a bit of hydrogen is left over the core the whole shell will be ejected. 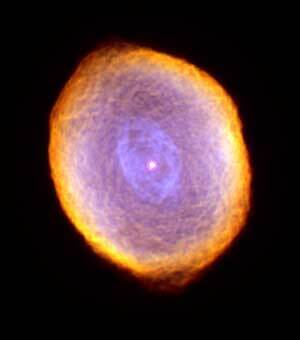 When the remnant stellar core has become hot enough, this nebula will glow from the radiation of this exposed hot core. 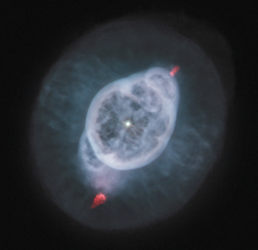 It is visible as a planetary nebula. The remnant core will emerge through the expanding veil of ejected material as a white dwarf. A white dwarf is very dense. It has half the mass of the Sun, but is only the size of the Earth. The white dwarf will very slowly fade away and over several billions of years turn into a dark and invisible briquette, floating lifeless in the vast graveyard of space. Continued expansion of the nebula at an average velocity of 90,000 km/h, combined with the decreasing radiation of the cooling white dwarf causes the brightness of the nebula to decrease rapidly. 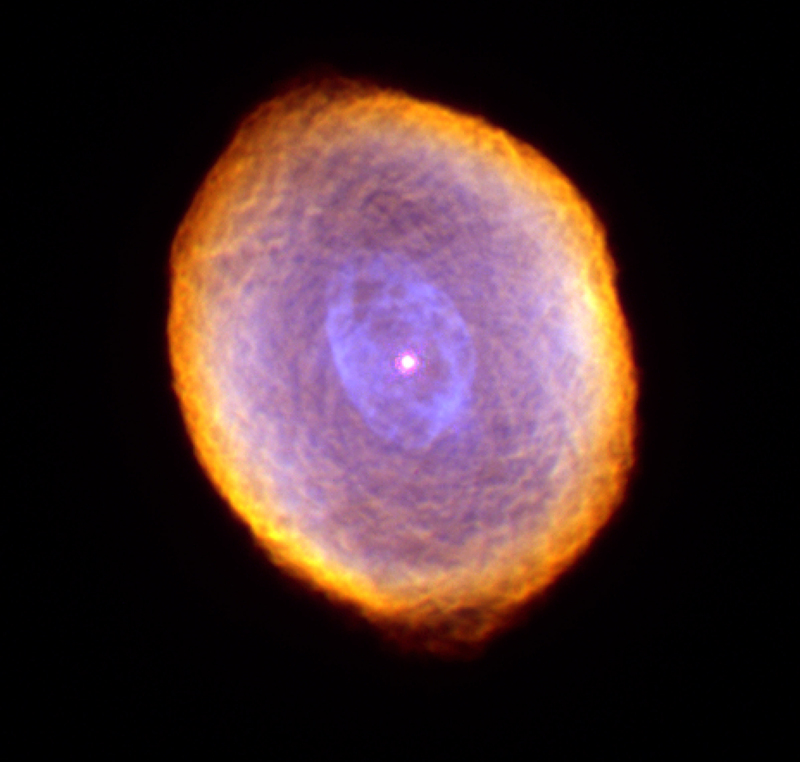 After roughly 25,000 years from its first appearance, the nebula would disappear from view. It eventually disperses into the interstellar medium, enriching it with carbon, nitrogen and oxygen, that were produced in the stellar interior. This material can be recycled to form other stars and planets, and eventually life. You are made of star stuff, we all are. The atoms of some of the elements that comprise our bodies were created in the depth of the stars. What we are is literally stuff of the cosmos - atoms that have been recycled many times before they came together to make you. Different ways in which dying stars eject their outer layers as highly structured nebulae. A montage of pre- and true planetary nebulae made with the Hubble Space Telescope Credits: Bruce Balick, Howard Bond, Raghvendra Sahai, their collaborators, and NASA. From left to right: M2-9, NGC 6826, Hourglass Nebula, NGC 3918, Egg Nebula, Cat's Eye Nebula, Hubble 5, NGC 7009, Red Rectangle, NGC 7662. Their beauty is matched by the mystery. The basic question is: how do these nebulae shape themselves ? A most intriguing challenge is to understand how stars transform their surrounding large spherical mass-loss shells in a couple of thousand years into the variety of shapes and sizes observed in planetary nebulae. There are a number of theories currently being investigated. No consensus about the dominant physical process responsible for the shaping of planetary nebulae has emerged so far, but there is agreement that the shaping occurs during or soon after the star ejects the nebula and the object is on its way of becoming a planetary nebula. The details of the rate of evolution and the strength of the stellar wind during this transition phase are essential ingredients in understanding the shaping of the planetary nebulae. However, both are very poorly known, either theoretically or observationally. To remedy this Dr Griet Van de Steene in collaboration with Dr Peter Wood from the Australian National University, and Dr Peter van Hoof from the Canadian Institute of Theoretical Astrophysics are studying a sample of IR-selected stars which are becoming planetary nebulae. Images and spectra provide us with information about what has happened during the star's life and how it dies. The nebula is about a light-year in diameter and is located some 2.000 light-years from Earth in the direction of the constellation Lyra. The colors are approximately true colors. The color image was assembled from three black-and-white photos taken through different color filters with the Hubble telescope's Wide Field Planetary Camera 2. Blue isolates emission from very hot helium, which is located primarily close to the hot central star. Green represents ionized oxygen, which is located farther from the star. Red shows ionized nitrogen, which is radiated from the coolest gas, located farthest from the star. 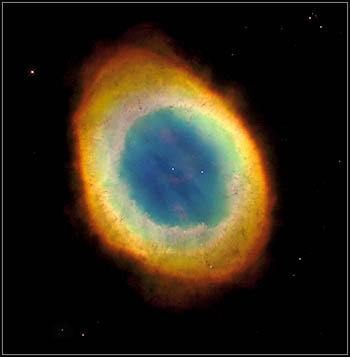 The gradations of color illustrate how the gas glows because it is bathed in ultraviolet radiation from the remnant central star, whose surface temperature is a white-hot 216.000 degrees Fahrenheit (120.000 degrees Celcius) A typical spectrum of a planetary nebula contains several emission lines. The properties of a planetary nebula (stellar temperature and luminosity, and chemical composition of the nebula) can be determined using the observed spectrum. The influence of the nebular structure on the determination of the abundances remains an issue. Dr Griet Van de Steene in collaboration with Dr Peter van Hoof worked on photo-ionization modelling in order to determine the chemical composition of planetary nebulae. 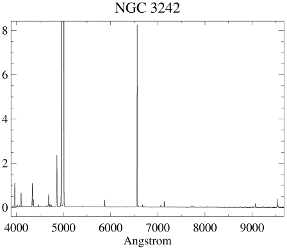 Spectrum of NGC 3242 obtained with the 1.52-m telescope and the Boller & Chivens spectrograph at La Silla Observatory of the European Southern Observatory by Griet Van de Steene. Planetary nebulae are observable in far away galaxies. The spectra of planetary nebulae include several bright emission lines, which make them detectable and recognisable over large distances, not only in the obscured regions close to the center of our own galaxy, but even in external galaxies, such as the Andromeda galaxy, and as far away as the Virgo Cluster. Dr. George Jacoby from the National Optical Astronomical Observatories in the USA and Dr. Griet Van de Steene have identified 95 new candidate planetary nebulae close to the center of our Galaxy. 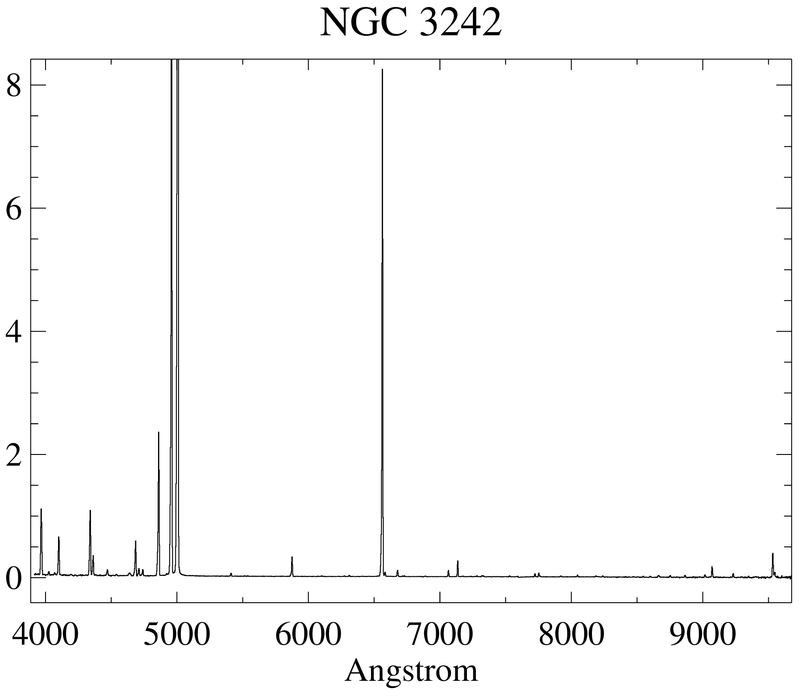 They have obtained follow-up spectra for ~65 of these to confirm all but a couple as bona fide nebulae. These observations of the Galactic center nebulae will help define the motions of stars in the central "bar" of our Galaxy, as well as flagging any nebulae that originated in the halo of our Galaxy but are presently passing near the Galactic nucleus; already, two very fast moving candidates have been identified as possible halo visitors. Thus far, only ~12 of the new ~90 planetary nebulae in the Galactic center have been analyzed to derive their chemical compositions. The chemical compositions appear to be similar to those found in the Andromeda galaxy by Jacoby and Ciardullo. In most of the remaining cases, it will not be possible to make the measurements because the nebulae are extremely faint, being extinguished by an enormous of dust between the Galactic center and the Earth. Thus, each nebula that can be studied is an important one. We are continuing our analysis of the existing spectra. Planetary nebulae can be observed out to large distances from the core of galaxies. The measurement of their velocities provides the only way to study the dynamics and the distribution of dark matter in the halos of elliptical galaxies. Planetary nebulae are used as candlesticks to measure distances to other galaxies and in this way contribute to unravelling the fate of the Universe. The chemical composition of a planetary nebula is determined by the chemical composition in the cloud of gas from which the progenitor star was formed and by the modification of these abundances by the nuclear reactions during the star's life. 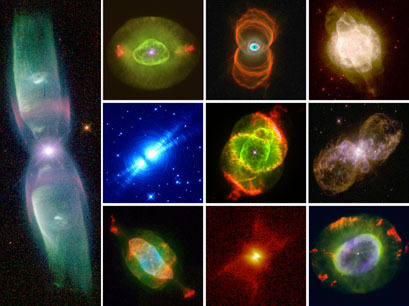 Hence planetary nebulae contribute to determining the chemical evolution of galaxies. There seem to be several times more halo planetary nebulae in M31 than in our own Galaxy. Jacoby and collaborators have accumulated velocities for over 800 nebulae in the nearby Andromeda galaxy. They have measured the chemical compositions of 15 planetary nebulae in M31. 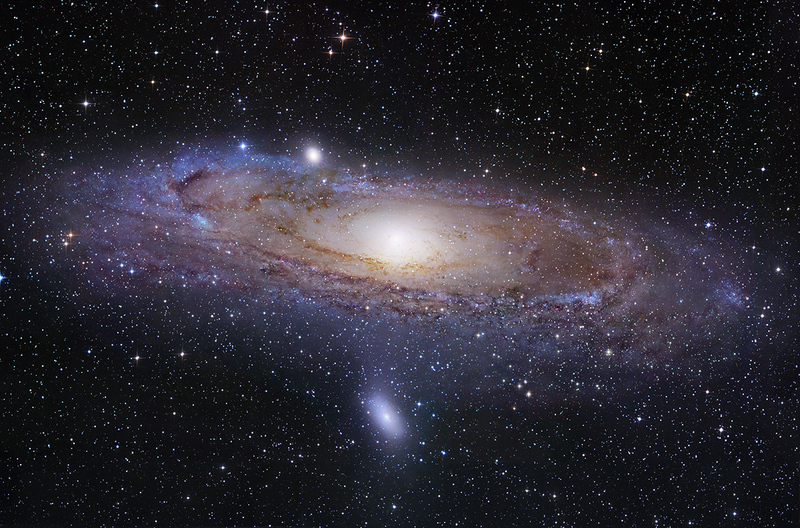 From these measurements, it is clear that the stars in M31 are derived from a complex history of chemical enrichment because they span a very wide range of compositions, from 20 times lower than the Sun to just slightly higher than the Sun.